This image is part of a weekly series that The Root is presenting in conjunction with theImage of the Black Archive & Library at Harvard University’s Hutchins Center for African and African American Research. 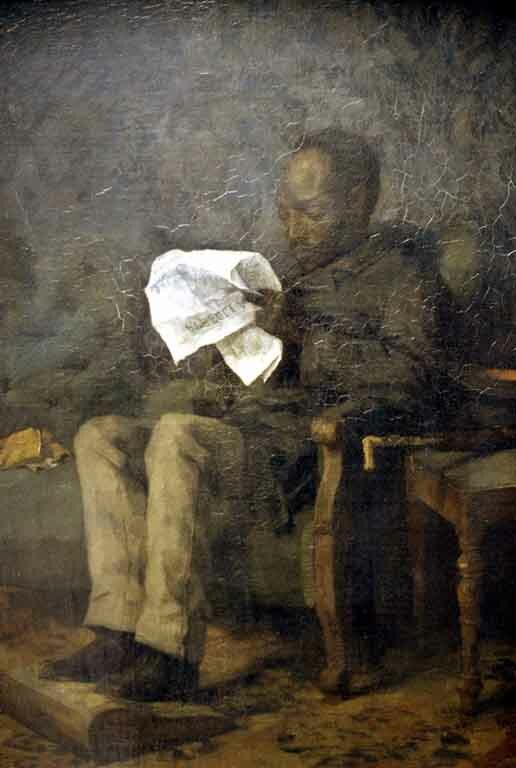 From the other side of a narrow ledge, a black man looks out from a picture with an air of calm detachment, his reciprocal gaze astutely evaluating the viewer. He holds a small cigar suspended between his head and a small purse lying open before him. The purse’s three opened compartments leave no doubt as to the complete lack of contents within. Lying so close to the viewer’s space, the purse serves as a talisman of the penniless state of the man seated just beyond it. The painting bears two traditional titles, neither apparently bestowed by the artist himself. One, Rauchender Mohr (“Smoking Moor”), is purely descriptive, while the other, Kassensturz (“Taking Stock”), piques the observer’s interest in the man’s living situation. The objective of such careful observation lies somewhere between the reserve of a formal portrait and the more immediate concern with the fundamentals of painting characteristic of the artist’s sketch or study. The candid portrayal of the smoker also provides a leitmotif for the experience of people of color in the newly emerging nation of Italy. Painted in a vivid but carefully controlled range of colors, the image of an anonymous black man took form in the studio of Wilhelm Trübner, a young itinerant artist exploring the wider world beyond his native Germany. At this time, only in his early 20s, Trübner had set out to travel and study independently after his tutelage with the influential painter Wilhelm Leibl. In 1872 he arrived in Rome, immersing himself in the works of the Italian Renaissance masters. His sojourn coincided with the nationalist movement known as the Risorgimento, which championed the recovery of a historically fragmented, cultural and political identity for the long-fractured Italian peninsula. Both the artist and his black subject lived within the quickened tempo of life in the recently established national capital. During his brief stay in Rome, Trübner seems to have engaged the services of casually encountered models. Among the most significant products of his brief stay is this remarkable painting and two others of the same subject and pictorial format. In one, the black man is posed in right profile. His form appears darkened against an expansive, cloudy landscape towering over a distant city, presumably Rome. In the immediate foreground appears a bouquet of flowers, dominated by the brilliant red of peony blossoms. The third work presents the subject in a more specific, interior environment, engaged in the focused activity of reading a newspaper. Set within a bourgeois milieu, the man sits on a comfortable sofa, his top hat, cane and gloves placed beside him. The masthead of the paper readsLa Libertà, or “Liberty,” perhaps reflecting Trübner’s own progressive political views, here transferred by proxy to his sitter. These three quite varied responses to the same subject were made ostensibly as studies of form and color. Trübner depicts the black man from the three principal viewpoints of the portrait format: full-face, profile and three-quarter. The studies are dated 1872 and 1873, so his experience with the model must have lasted for as long as several months. As far as is known, the artist never again devoted such energy to the depiction of a black subject during his long career of over 40 years. In this case, however, Trübner may have been motivated in his choice of subject by the opportunity to study the effects of light and color on a dark-skinned person. Yet his engagement with his model already manifested a nascent attention to character typical of the realist tradition of German painting. A simple study is transformed into an insightful investigation of the sitter’s personality, along with a hint of narrative created by the inclusion of the cigar and purse. The memorable record of an anonymous black man at the dawn of modern Italy also raises the question of the reception of people of color in the peninsula during the modern period. Emerging evidence reveals the development of unique attitudes to race during dramatic episodes of social upheaval and the struggle for national identity. While Trübner worked in Rome, vast numbers of native-born Italians had begun to depart to seek better opportunities in the United States and elsewhere. The calm demeanor of the man with the cigar belongs to the brief period between the end of slavery in Italy and the beginning of the government’s imperialist ventures in Africa. At its southernmost extent only about 90 miles from the North African coast, Italy would soon embark on the same agenda of colonial expansion as other European nations. Many Italians left to settle in new zones of occupation in East Africa. Conversely, like Trübner’s model, black people found their way to Italy by various means. During previous several centuries, black people had worked throughout the peninsula as servants and even slaves. For young men, a common means of entry was through bustling seaports such as Civitavecchia, Rome’s major opening on the Mediterranean. This may have been the case with the man seen here, though he could also have been one of a significant number of long-time residents engaged in any number of occupations. In Italy today, the situation of people of African descent continues to evolve. Their reception unfortunately may now be less accepting than in previous periods. Born in the early 16th century to a black mother, Alessandro de’ Medici also bore the pedigree of one of the most distinguished families in Italy. His dark complexion did not seem to affect his career, as in due course he became duke of the powerful city-state of Florence. Five centuries later, political success at the highest level is still possible for people of color, but frequently is tainted with the unwelcome specter of racism. In 2013 Cécile Kyenge, a Congolese immigrant, became the first black Cabinet official in the country’s history, serving as minister for integration. Her appointment was met in conservative quarters with the most savage opposition, including the frequent comparison with orangutans and the appearance of nooses hung on lampposts. No doubt such repugnant demonstrations of bigotry are countered by the less well-publicized, but genuine, acceptance by other segments of the population. The lines along which the future course of assimilation will develop seem firmly drawn, a challenge to a modern nation whose outcome is still anticipated by the challenging gaze of Trübner’s model.